I would like to share with you two commissioned portrait about the Birman sisters. Kadife is a sweet little pirate kitten. She lost one of her eye due to acute glaucoma, because she was lucky to be treated by a good vet who knew which is the best decision in cases like hers. She is a charming fluffy creature, living a very happy life with her sister Kutsal, in Norway! Both sisters are beautiful creatures, and I enjoyed to paint about them equally. I am not able to decide which is more cute, I believe it must be amazing to have two fluffy hairball as company at home! My third painting was made of a photograph about April and Adele, the sweet tabby kittens. What is more cute than a kitty? Two cute cuddling kittens! These sweethearts just cannot get enough from eachother, and it is exactly what they call a cuteness overload! Three watercolor cat paintings from my Cat Portraits Collection. On the first painting a Bengal and a Savannah cats somehow were swallowed by a giant white towel, which sent them together immediately to Dreamland. The second painting is a commissioned portrait about the tuxedo Elvis had a very tough start in life. As a kitten, he was living with a hoarder, who couldn’t care less of him. When he was hit by a car, nobody took him to the vet to see his broken jaw, so it fixed by itself without any assistance, and left him with a little a teeth exposed from his mouth. When they found him, was already nothing to do, but he got a second chance, and was very lucky as Dawn rescued him, and he is having a happy life since then with his new loving family. He is a perfect, jolly guy, and the cutest cat ever! That is why I give the title to this cat portrait, Lucky Elvis! And finally a Lynx Point Siamese Cat Painting inspired by by a photograph I received to my Cats of Karavella Atelier Facebook page! I must be biased when I choose a lynx point cat to paint, as I have one myself. so obviously I found them absolutely gorgeous! And Paulie was a perfect model, with his sparking sky blue eyes and typical lynx point coloration, which give the reason to call this cats as Snow Tigers referring to the White Siberian Tigers. Cat Art Series by Dora Hathazi Mendes featuring Cat Cocktail, from the Cats of Karavella Collection. Read the story behind my Cat Cocktail painting, in the Blog of Cats of Karavella. Visit the Cat Cocktail Cat Art at the Official Website of Dora Hathazi Mendes for high quality and variety of prints such as canvas, acrylic, framed, wood etc. , and related products with Worldwide Shipping. For customizable products go directly to the Cat Cocktail Collection of Zazzle Shop Cats of Karavella, or find your own Country Store at the International Store Links of Cats of Karavella to which offers also Worldwide Shipping. For available originals and commission works, please contact me. Thank you for supporting my cat art by sharing! Cats of Karavella Collection featuring the Legend of the Siamese, Cat Art by Dora Hathazi Mendes. 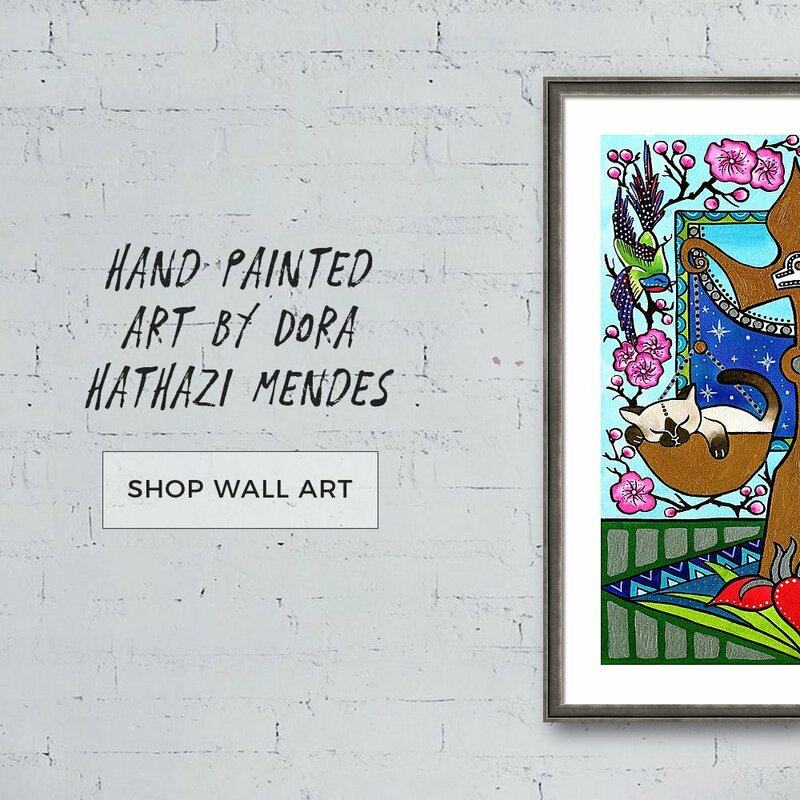 Visit the Legend of the Siamese Cat Art at the Official Website of Dora Hathazi Mendes for high quality and variety of prints such as canvas, acrylic, framed, wood etc. , and related products with Worldwide Shipping. For customizable products go directly to the Legend of the Siamese Collection of Zazzle Shop Cats of Karavella, or find your own Country Store at the International Store Links of Cats of Karavella to which offers also Worldwide Shipping.